Since the early 2000s, the United States has been obsessed with the Maker Movement – exhibition fairs, how-to videos, books, magazines and entire TV networks dedicated to learning how to do-it-yourself. 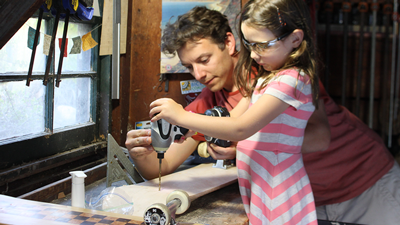 with his daughter at SK8Makers HQ (aka the garage workshop). Cal Poly Craft Center exhibit, circa 1998. The development of the book was seemingly predestined, informed by his time at Cal Poly. “My first year at Cal Poly, I was just exploring student activities,” Berger recalled. “One day, I walked into the Craft Center and signed up for a woodworking class. Basically, any idea you had, the Craft Center was a place you could go to make it come to life.” That class led to a part-time job cleaning the woodshop and teaching safety classes and later as student manager. Leaving Cal Poly, Berger put his journalism degree to work as a daily news reporter covering Silicon Valley’s dot com boom and subsequent bust. Five years later he left San Francisco to merge his journalism career with the passion he had pursued at the Craft Center, and became an editor at Fine Woodworking magazine. After crafting more than 100 skateboards for family and friends, former editors at Fine Woodworking approached Berger to write a book about the process for their start-up imprint, Springhouse Press, which publishes titles on niche DIY topics like cooking and woodworking. Over the course of a year and a half, Berger wrote, illustrated and photographed the book in his garage. Through late nights and early mornings, balancing his day job and family, the book was completed. The end result is an illustrated guide to skateboard building, with a chapter on the industrial history of the skateboard, as well as profiles of other skateboard makers around the country. “The Handmade Skateboard” has sold more than 4,000 copies in its first year. It even won a cover endorsement from fellow woodworker and NBC’s “Parks & Recreation” star Nick Offerman. Learn by Doing helped ready Berger for his day job and influenced his entrepreneurial-maker spirit. 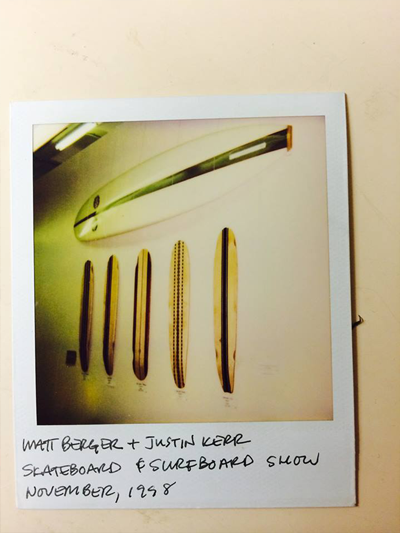 Read more about Berger and “The Handmade Skateboard” online.